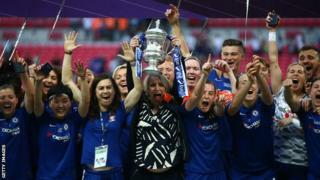 Chelsea celebrate winning the 2017-18 Women's FA Cup at WembleyWomen's Super League champions Chelsea Ladies are to rename themselves as Chelsea Football Club Women.The club say the change underlines the "ever-growing status" of the women's game and is a move away from referring to the men's side as the 'first' team.There are now only nine WSL teams with 'ladies' in their name, of which five are in the top tier. "We believe this is an important step for the evolution of our women's team," Chelsea chairman Bruce Buck said. 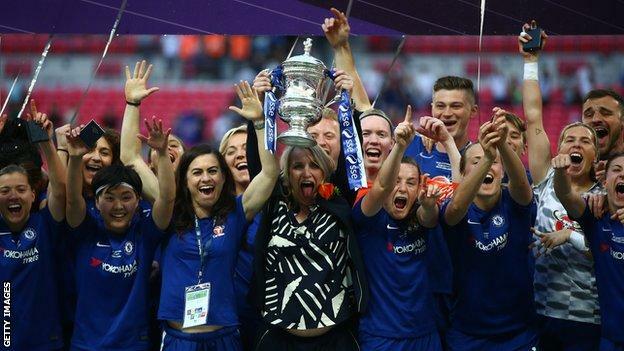 The Blues' decision to change names comes almost a year after London rivals Arsenal dropped 'Ladies' from their name and became Arsenal Women.Chelsea won the Women's FA Cup as well as wrapping up the WSL title with a league game to spare, and also reached the Champions League semi-finals. "This name change demonstrates the club's desire to put women's football at the front and centre of everything we do," manager Emma Hayes said. "Chelsea's continued commitment to the women's game is unwavering and this decision is something I fully support."